There are three varying types of shaft measurement available and currently in use. The first is a collection of handheld gauges, often mounted to a mechanised fixture to simultaneously engage and support a number of dimensional checks. While these tools offer enhanced economy, as well as speed of measurement for specific applications, it is almost impossible to adapt them to new shaft measurement tasks. Manufacturers in need of a more flexible measurement solution often look to invest in the second type of shaft measurement machine available. A more generalised version of the higher-end optical systems, is the manually operated system consisting of a series of measuring tools mounted on a precision bed next to a lathe-like part mounting assembly, with a computer interface for electronic data capture. These measurement systems, dependant on the configuration, offer a solution for a number of basic measurement tasks, including length, diameter, run-out and axial run-out, as well as the ability to collect complex measurements such as distance, width of recesses, depth, diameter of recesses, roundness, taper, angle, radius, intersection point and position of cross holes. An ideal option for smaller manufacturers who may produce a wide variety of parts in shorter runs, whilst requiring flexibility and simplicity in their measurement processes. Typically a single machine would measure crankshafts, camshafts, gear shafts, toothed racks, outer races, hollow shafts, drive shafts and control pistons, providing a multitude of measurement capabilities in one system. These machines are generally easy to use, can be integrated into shop floor environments and acquired on a modular basis, readily configured for different parts and do not need recalibrating between different part measurement. The final and most efficient shaft measurement machine is a fully automated, optical and non-contact measurement system, specifically designed to facilitate precision control of complex turned components. These all-in-one advanced optical solutions are able to operate within the production environment, and in a matter of seconds at the touch of a button. 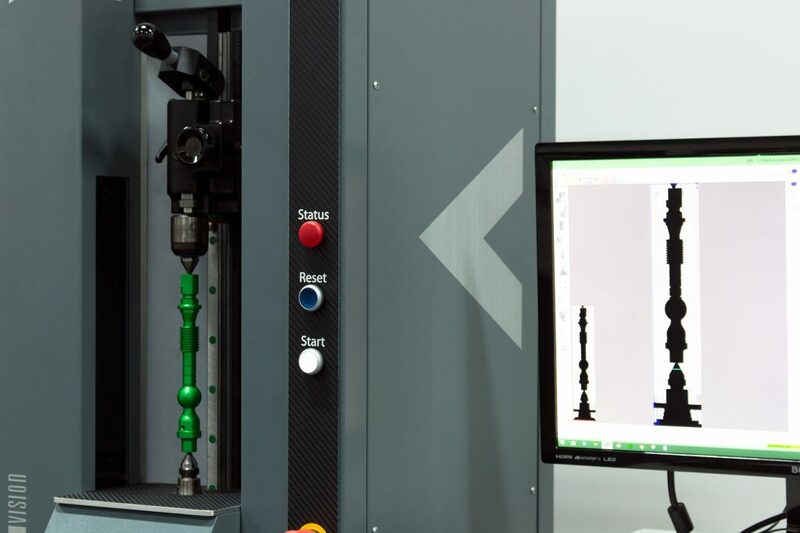 This type of system allows for the accurate measurement of intricate turned parts without human error, by avoiding operator intervention during the measurement process. The reduction of operator influence coupled with graphic interfaces and intuitive software allows for simplified programming and use. As the demand for increasingly smaller part features and tighter tolerances continues to grow, so too will the demand for these non-contact, non-destructive shaft measurement machines. The use of high-resolution, matrix array or CCD cameras has been introduced and put to use recently alongside advanced computer processing technology. These systems can conduct measurement routines from a single image and a higher resolution offers increased accuracy in part data collection, as well as recording much smaller features than the calculated image of a line scan. 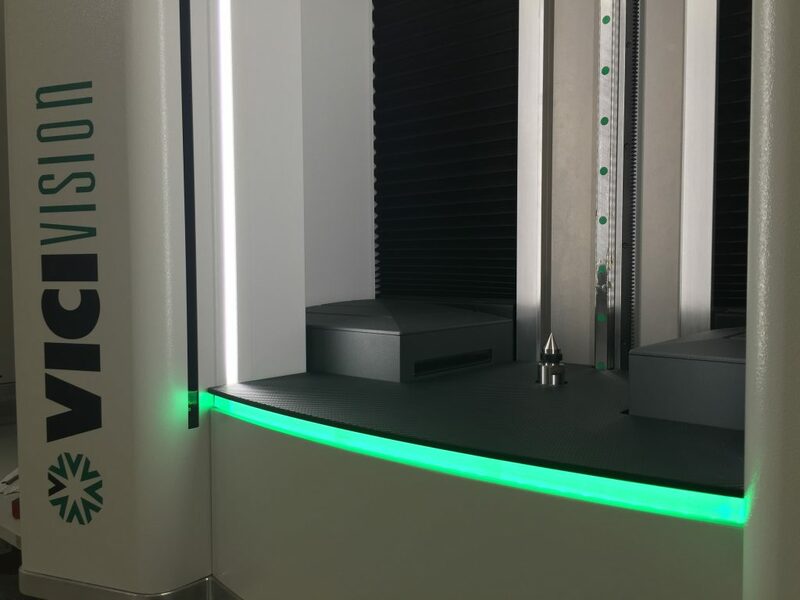 At VICIVISION our shaft measuring systems work by rotating the part while the light source is projected onto the component, creating a shadow composition of the object, from which directly opposite a video camera captures the smallest details through a telecentric lens. This measurement takes between 30-60 seconds, eliminates human error, and generates a process of automatic data collection. Compared to conventional measurement methods where it would take up to 30 minutes and could contain human error VICIVISION optical measurement systems are an effective solution in reducing downtime and increasing precision in measurement data.